Are you thirsty for knowledge and love to brainstorm? Then you should like this article. Yes yes yes! We will introduce you to different games that will put your knowledge to the test and ultimately help you shine in society, impress the gallery or simply educate yourself while passing the time. Here are five Android applications or iOS that, if you use them on a daily basis will make you a crack at general culture. 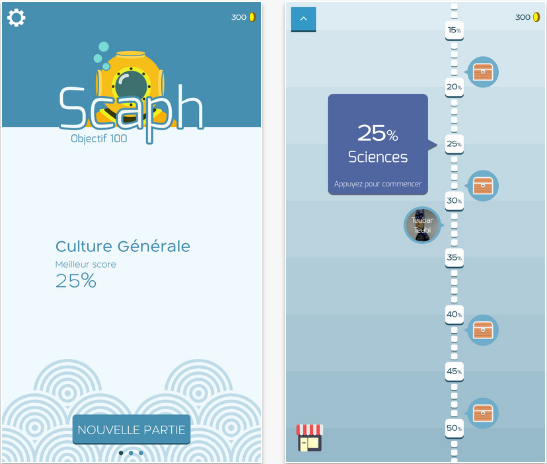 Scaph is a quiz in which you play as a diver who plunges into the depths of general culture. The better you answer questions of history, mental arithmetic or geography, the deeper you go. Obviously, the closer you get to the abyss of Ge Culture, the more difficult it gets. Fortunately, you have bonuses at your disposal: a lifebuoy in case of a wrong answer or a submarine to progress faster for example. These bonuses are also available in the application's shop. The game has a social dimension allowing you to play with your friends by logging in via your Facebook account. Unfortunately, this is not a real port of the famous Trivial Pursuit game on Android. 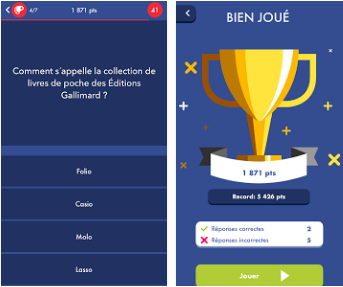 Trivial Quiz is a game of general culture offering 7 themes: geography, entertainment, history, art and literature, science and nature, sport. Relatively basic, however, this game is a good way to learn quickly and easily in transport or waiting rooms. 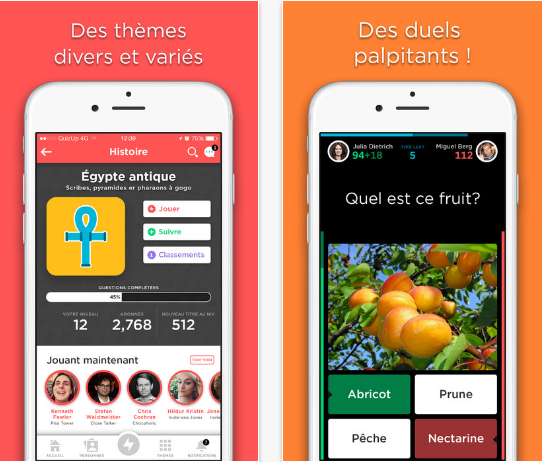 QuizUp claims to be the world's largest general culture game on mobile platforms. And we admit to you that he may have a point. You can compete with millions of players while specifying age, location or interest criteria. It is possible to challenge your friends in real time on the theme of your choice. As the sessions progress, you will win virtual titles and gain places in the world rankings. QuizUp also includes a chat feature, allowing you to chat with your competitors. 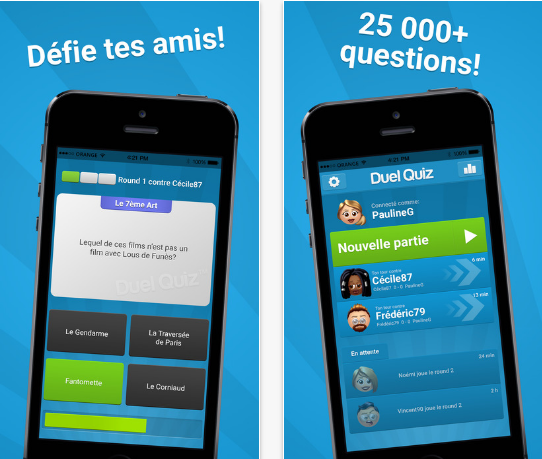 Duel Quiz is one of the most popular general culture games on iOS or Android. Its concept is simple, to face your friends or random opponents during 6 thematic rounds (stories, beliefs, art, sports etc.). Each round consists of three questions. The player who wins the round is the one who answers more questions correctly. Note that players can also contribute by sending their own questions. To face your friends, you can connect via your Facebook or Twitter accounts. Funny name for a general knowledge application, isn't it? This game offers you the opportunity to learn a little more about general culture by asking you various and varied questions (about ten themes). In its paid version (0.98 cents), it displays the explanation accompanying each answer to help you improve your daily life. This application does not require any internet connection to operate. This completely crazy quiz should catch your attention. Very original, he invites you to answer the funny questions of a counsellor straight out of the psychiatric asylum. Nope Quiz has nothing to do with the other games in this selection. This is an original quiz in which you will probably not learn much. Its principle is simple: the facilitator considers the right answers to be wrong and refers you to the first question for each error. As you will have understood, the goal is to work on your memory while having fun around a question of general culture that is at the very least original. Be careful this game requires a constant connection to the Internet. NB: Some of these games, although free, may require you to pay to unlock options that will allow you to enjoy all the features. You are free to unlock them or take advantage of the free versions. 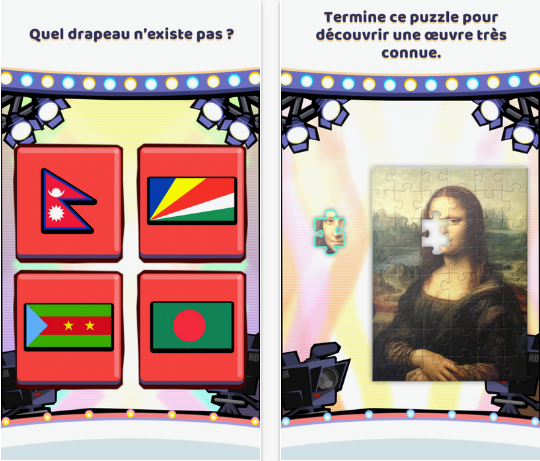 Do brain training games really make you smarter?